Welcome to CloudCheckr Webinars—where we learn how to use comprehensive cloud management in the modern enterprise, as a service provider, and in the public sector. In this webinar, service providers and resellers looking to maximize profits, automatically generate invoices, and control where charges and discounts are applied will find that CloudCheckr cost management fits the bill. We’ll focus on the benefits of Reserved Instances, commonly known as RIs. The major cloud providers—Amazon Web Services (AWS), Microsoft Azure, and Google Cloud Platform (GCP)—all offer a form of discount for customers who reserve computing power in advance. These Reserved Instances can result in savings of up to 75% compared to on-demand rates. For committed cloud users, RIs can be a great deal. 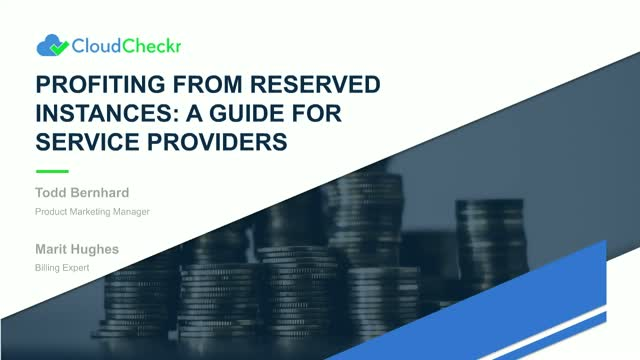 Attend this webinar to learn how to use arbitrage and CloudCheckr Reserved Instance Purchase Recommendations, as a managed service provider (MSP), to increase profitability.